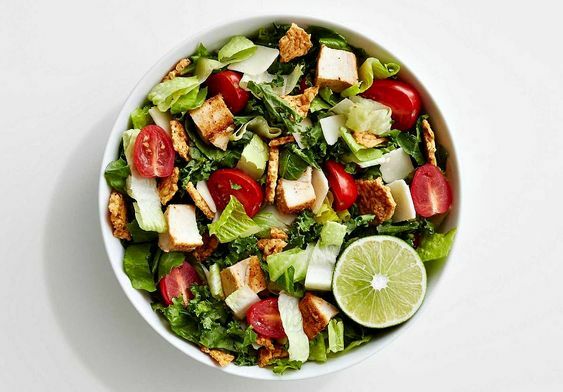 Sweetgreen kale caesar, my usual weekday lunch! As I mention somewhat frequently, I'm fascinated by the Refinery29 Money Diaries format and the heated discussions it generates. I've thought about writing my own here, but it's always felt like too much of a production. I make a lot of choices that sound extravagant, so I worry about how people would react. Plus, past biglaw money diaries tended to be more unpopular than average. It was only after I saw Man Repeller's Money Diaries (thanks to Luxe's link), which are more relaxed and more narrowly focused on the week's spending, generally omitting monthly details that hint at the writer's larger financial situation, that I was struck with fresh inspiration. This week turned out to be a good one for illustrating many things about how I do money, both now and in the past, when one of my main spending vices, a way that money regularly disappeared without bringing much utility, was shopping on Amazon for an excess of home goods and supplies for new hobbies I often didn't end up sticking with. I don't think that's exactly what happened this week, but it gives a good illustration of what I meant. Starting with this particular Sunday might understate my typical weekend spending. On Saturday, I went out to dinner and took a cab, but was a homebody today. We have breakfast at home, bacon and eggs, and it's almost noon when we're done. I walk to Fairway for groceries. Trader Joe's is just as close and significantly cheaper, but on Sundays it's much too crowded after 10:00 AM. I buy some salmon (pricey, nearly $20 for ~1.6 lbs! at TJ's I'd have gotten ~1 lb for $12) and broccoli for dinner. I wanted less salmon, but some of the stock didn't look as fresh, and the best combination I could get was two pieces totaling ~1.6 lbs. 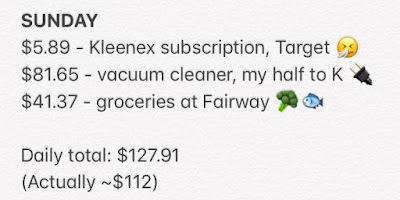 I also grab some other items (cheese sticks, coffee creamer for K, yogurt for myself, not much else) for a total bill of $41.37. NYC grocery expenses are killer. 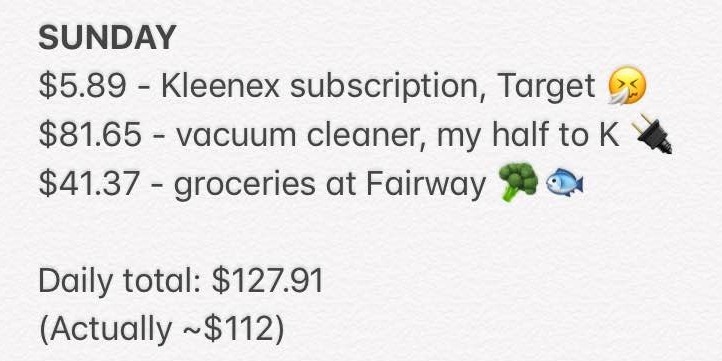 K and I split utilities, household goods, and groceries for shared meals more or less 50/50 (hence the "Actually ~$112" above). We "net it out" at the end of the month and whoever owes the other, if any, does a bank transfer. K's paid the utilities on our behalf, while I bought household goods (like the $5.89 Kleenex subscription from Target) and more groceries. We don't go line by line and split all shared groceries though, just pricier items like the salmon, because sometimes, maybe 20% of the time, K does the shopping instead and doesn't keep track for netting out, so I don't track the smaller items I get either, and assume it all evens out. It's a little weird, but it just evolved this way and works for us. We're not sweating the small stuff, actually, though our method might make it seem like we do! Today, we've finally decided to get a bigger vacuum than the Dirt Devil Scorpion handheld we've used for years. K orders it, and I send him my half right away, $81.65, because it was pricey. As for shared Seamless orders, we take turns paying. Some restaurants are more expensive, but it all evens out in the end. (We order together frequently, at least once a week, often more.) Today's lunch is K's turn, and it's sushi from our go-to place. My two-roll lunch special (salmon avocado and eel avocado) with miso soup costs about $16.00 including tax and my half of a ~$6.00 tip. We're having a quiet day at home, and K does a fair bit of work from home. We each make time for a workout, mostly using a folding stationary bike we keep in the apartment (which has proven to be a great purchase over the two years we've had it). This is the first thing I'd be judged heavily for on Refinery29 (and it deserves judgment on both environmentalism and frugality grounds), but we're also getting a Blue Apron delivery. It arrives in the afternoon. It's normally $51.95 for two meals for two, or ~$12.98 per meal per person, including shipping, but today was free with a friend's referral code. We've found that our schedules are too unpredictable to buy groceries and plan meals for weekday dinners, and we're hoping to reduce our reliance on Seamless. I've occasionally written about trying to meal prep and batch cook, but it hasn't worked out so far. I cook salmon and broccoli tonight, saving the Blue Apron meals for Monday and Tuesday. There's enough left over for one of us to eat the rest for a weekday meal. 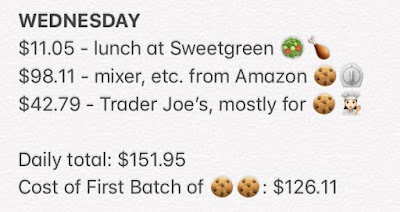 For my spending on Monday, Tuesday, and Wednesday, please follow the link below! I pay for the Netflix membership that my mom, sister, and I share, and that $13.99 charge posts today. It's a pretty normal day at the office, a little quiet because the person in charge of my current matters is out of the office on another case all week. Here's another thing that would come across poorly on Refinery29, and to pretty much all personal finance bloggers ever, particularly if they're not based in NYC and/or working in an intense industry, but I get lunch out every day, usually a salad. My first workplace had a subsidized cafeteria, where this cost only $5-$6 a day, similar to making it myself with Trader Joe's groceries. Were I to rely on another NYC grocery store, the homemade salad would cost more than the subsidized cafeteria. These days, however, there's no more cafeteria, so I typically go to Sweetgreen or Chopt, generally ordering online for pickup to save time. Today's chicken tinga salad from Chopt costs $12.61. Because it's quiet at work, I head home right around 6:00 p.m., and get started cooking our first ever Blue Apron meal, a pork chop dish with a "salsa verde" made of parsley and capers (is it really "salsa verde" then? ), roast potatoes, and some sauteed kale. It's fairly straightforward, though involves a few more steps than meals I plan myself, and so it takes me a little more than an hour. K arrives around 7:00, and we eat. After letting dinner digest, I work out using our stationary bike at around 9:00 p.m. After about half an hour, I switch to pilates, still using one of Blogilates's older beginner videos. This particular morning is a little special, as I'm getting admitted to federal court! I was admitted to the New York state bar long ago, which qualifies me to practice in state court, but federal court requires additional paperwork and fees. With the Southern District of New York or SDNY (sometimes called "The Mother Court" because it's seen so many major cases throughout its long history), I've already paid the fee, which my workplace already reimbursed, while filing my paperwork weeks ago. I head down to the Manhattan courthouse in the morning (using a pre-tax transit benefit Metrocard from work) and it takes a while for around thirty other attorneys and I to get sworn in before the judge. Once that's done and I have my certificate of good standing, I hop on the subway to the EDNY in Brooklyn, where I can "waive in" and be admitted immediately, upon paying a $201.00 admission fee that my new workplace will also reimburse. By the time I've finished with court, it's time for lunch. I stop by the nearest Pret a Manger after getting off the subway near the office, because it's faster than Chopt or Sweetgreen and I don't have time to order online and don't want to brave the long line at either place. The salad looks less substantial than what I usually get, so I add a half sandwich for a total of $13.33. Because it's still slow at the office while my colleague is out, I head home around 6:00 p.m. again and start cooking our second Blue Apron meal, cheeseburgers topped with Jalapenos and goat cheese. The charge for our second Blue Apron box, the full $51.95, posts to my credit card today, and K and I will split that. Because of that and the work reimbursement for the court fee, I've actually spent $39.91 today. Now this is a much bigger, more anomalous spending day than I've had in a while! Things remained quiet at the office while my colleague is still out, and during a lull in my workday, I remembered reading about how Luxe and Smitten Kitchen both made the Alison Roman salted butter chocolate chunk shortbread cookies recently, and how tasty the cookies looked. One thing leads to another, and I decided I shall make them too. Keep in mind that I've never baked anything from scratch before, so I don't have certain key supplies. I haven't done this in years, but an active Amazon Prime membership makes trying new hobbies easy, so it's not long before I have a hand mixer (this Cuisinart recommended by Wirecutter), Pyrex mixing bowls, and new measuring cups and spoons (my old plastic set from law school is missing pieces and the numbers have rubbed off) coming my way for $98.11. The baking tools may be the type of thing K and I generally split, but this impulse to bake came over me so suddenly, and is such a random idea, that I consider it a personal hobby rather than a true shared expense. I head home around 6:00 p.m. and go straight to Trader Joe's to buy ingredients for cookies, including salted butter, three types of sugar (white, brown, and turbinado), flour, vanilla extract, and dark chocolate chunks. Normally, my local Trader Joe's is extremely busy after people start getting out of work, but it's not so bad today! I also get strawberries, eggs, and milk, for a total bill of $42.79. Once I'm home, I eat the leftover salmon and broccoli from Sunday night. Today's spending totaled $151.95, but $126.11 of that was all for making the Alison Roman cookies later this week. Part 2 of the Money Diary will come soon, probably early next week! Has anyone else tried Blue Apron or its competitors? I'm a few weeks into our Blue Apron "experiment" now, and want to switch to a competitor to see if I like the recipes from another company better. (I generally find Blue Apron's recipes unnecessarily fussy, and I don't like some of the flavor combinations they seem to rely on frequently.) And yes, I feel bad that it's really a "bad minimalist" thing to do, but it's been one of the only somewhat reliable ways to get us to cook weekday meals so far.